Outlaw Bunny | Welcome to my site for multifaceted you. I'm Francesca De Grandis. Books, classes, blog, fantasy art, & more. An interdisciplinary interweaving of newly evolving DNA. Starting Monday April 29, 2019. I’ll give you a direct spiritual transmission that creates abundance for you. For three weeks, I do your spiritual transmission five days of each week! There tends to be both immediate and long-lasting results. Enrolling is an easy way to say yes to prosperity, yes to life, and yes to all its gifts for you. Pick the apple from the Tree of Life. This transmission helps you have financial well-being and a wonderful life. Whether you feel too blocked to create prosperity, are wholeheartedly taking action to create it, enjoy enormous abundance already, feel hopeless about getting ahead financially, or are having an altogether different experience, the transmission adapts to you, not only sending more abundance your way, but also providing what you need inside and out to move toward abundance. Cost for Opulence Direct Spiritual Transmission: $130. Pay securely with PayPal: click the Pay Now button. Upon receipt of payment, you receive an email confirming enrollment. Feel free to phone me to discuss payment plan, scholarship, partial scholarship, or trade. 814-337-2490. No refunds. Pick the apple from the tree. Enroll now. Receive abundance. Magic is not a substitute for psychiatric counseling, medical care by a physician, or other therapeutic treatments. Participants are personally responsible for the consequences of their voluntary participation. This ceremony is extraordinarily effective but may not work for all individuals. Sometimes, I want a simple, quick way to creatively express my spirituality. That’s not my usual mode. Most of the time, I’m a do-it-from-scratch girl. I spin fibers into yarn, then weave the yarn into magical hats to keep me warm in winter. I dye fabric and paint my own designs on it to make altar cloths. 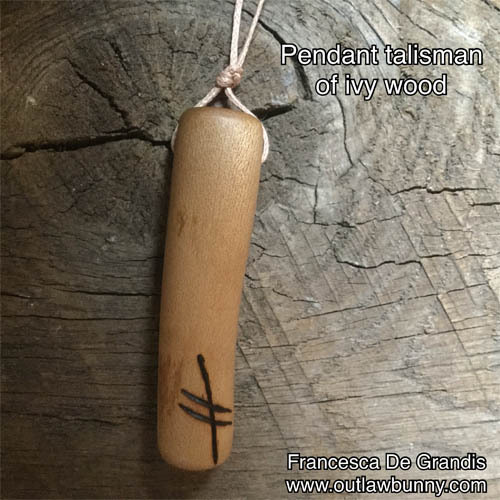 I cure a piece of wood for months, if not years, and then sand its rough surface for hours, smoothing it to create a talisman. … Well, it’s not completely from scratch: I don’t harvest all my own wood, rarely concoct my own fabric dyes, and have never raised sheep for the wool fibers I spin. In any case, sometimes, with my busy schedule, I want a project I can finish quickly. So, when Stencil Revolution offered me free stencils, I was delighted. Much as I revel in coming up with my own designs, it was fun to work with someone else’s. And Stencil Revolution allows you to bring beautiful artwork into your home without having to pay an arm and a leg. 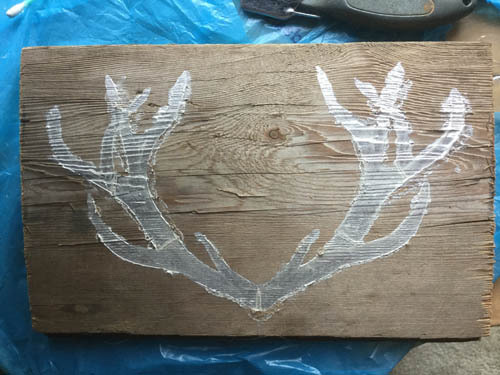 All that’s needed is a stencil, a bit of paint, a paintbrush, and a few common household items, such as masking tape to hold a stencil in place while you apply paint. … And, of course, an item to stencil. A friend had gifted me gorgeous pieces of weathered lumber. Not wanting the projects to be costly, I decided a white paint and a black paint would be enough. I chose the 2.25 oz size of Jacquard Neopaque Black and Jacquard Pearlescent White. Those little sizes are enough to do oodles of small projects. I chose those paints because they’re inexpensive, excellent products, easy to use (simple instructions are on the bottle), and, being a bit thick, are less likely to bleed past the cut edges of the stencil. They’re also suitable to cloth, wood, and other surfaces. If you apply these paints to fabric, it is washable, once set. Easy setting instructions are on the bottle. I suggest a test run on a piece of paper, thick card stock, or old cloth, just to get the hang of stenciling. When painting, I pressed down with one hand on the stencil, right by the cut edges of where I was painting, to moosh the edges flat against the wood, so paint wouldn’t run under those edges. I used too much paint, so some of it crept under the edges. The use of old timber contributed to the bleeding; as gorgeous as the reclaimed wood is, it’s an uneven surface. But I’m still quite happy with how the projects turned out. The next time I might, instead, use a near dry brush, then remove the stencil, and fill in paint where needed. 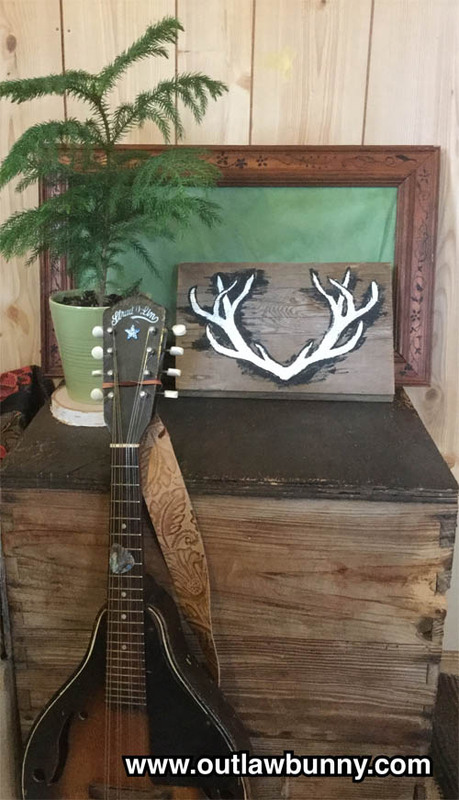 When I removed the deer antler and crescent moon stencils, and saw the bleeding, it was tempting to give up and abandon my projects. But I’ve learned that a “mistake” in the creative process is an opportunity to make the project better than I’d originally envisioned it. I used a Q-tip, toothpick, or X-Acto knife—depending on which worked best where—to scrape off as much of the unwanted wet paint as I could. 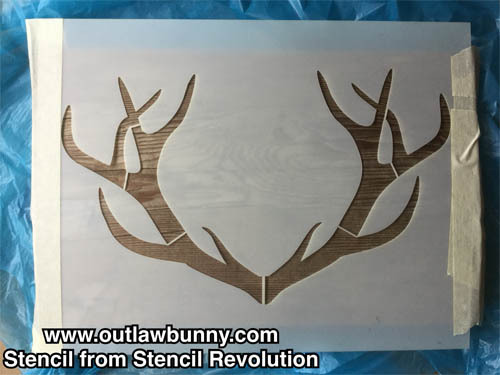 Then, for the antlers, I used black paint to draw the outline that had been intended in the stencil. I drew freehand instead of stenciling. 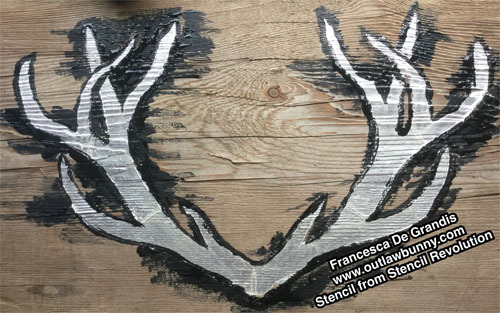 Then, to continue covering up the white paint bleed, I extended the black, roughly surrounding the antlers. I like the effect. Its roughness and hand-painted quality go well with the aged timber. The bleeding was lovely synchronicity. Without it, I never would’ve thought to add the black paint. The moon stencil was quite forgiving, when it came to bleeding. A few brushstrokes to spread the paint a bit in a couple of places did the trick. The bleeding in the moon project, too, was lovely synchronicity. The Gods are always with us when we’re creating. 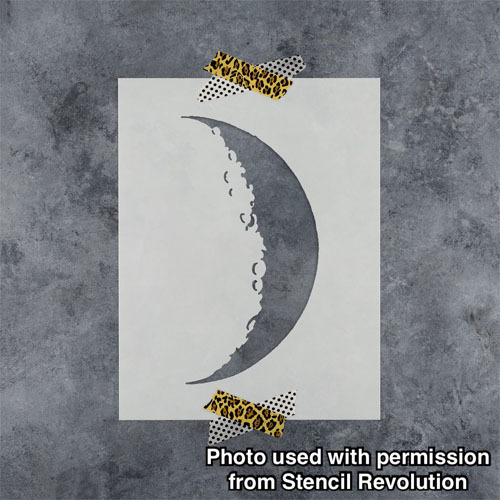 The outer curve of the moon stencil is a smooth line (see below), but bleeding paint made that edge ragged, which looks beautifully natural, like the moon’s actual bumpy surface. Since the inside curve of the stencil is bumpy, it was nice that the outside ended up matching. 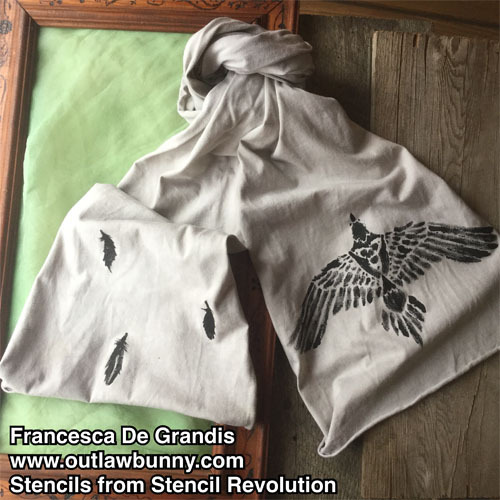 Next, I used the raven stencil and part of the arrow kit stencil on a scarf. I applied a light application of paint, so there was nowhere near as much bleeding. I’ll love wearing the scarf. In fact, I like the sort of batik look created by the combination of a bit of bleeding and my using a brush that had less paint on it. And, after removing the arrow kit stencil, I was able to, freehand, easily add strokes here and there to make everything look pretty, yaya! On my walks, I see raven feathers on the ground. I never pick them up. To me—and this is just my personal interpretation, I’ve never read this anywhere—Raven Spirit drops a feather by me when I need a reminder to live in the moment, focusing on enjoying my walk, rather than being distracted by worries, resentments, or the gathering of feathers. When I put on the scarf to keep me warm for my walk, the raven and its falling feathers on the scarf will be an additional reminder. 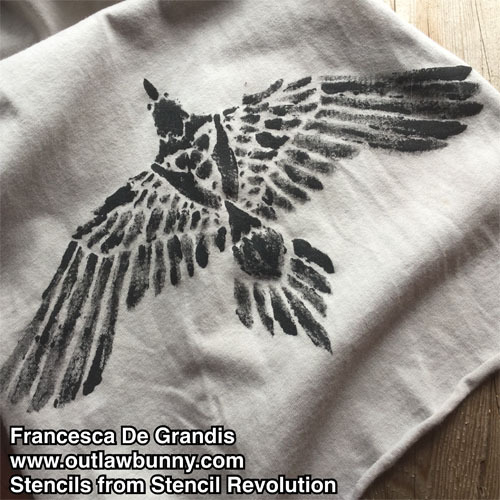 When stenciling on cloth or paper, lay it on a smooth, hard surface, to avoid bleeding. If stenciling the front of a T-shirt, stick flat sheets of newspaper or something else absorbent inside the T-shirt, so the paint doesn’t leak onto the T-shirt’s back. I’m a perfectionist. Going with the flow and experimenting allows my high standard to remain without stopping a project dead in its tracks. Not every piece works out but, if I just keep going with it, good chance it pans out beautifully. What an easy way to turn fabric into altar cloths or festival banners, or to adorn a ritual robe or T-shirt. 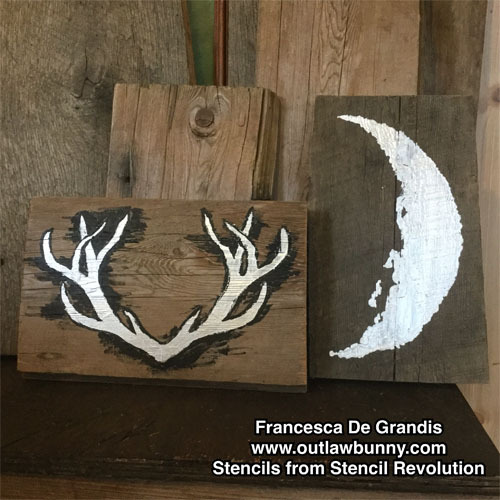 A last little tip: Once your project is done, and your stencils are washed and dry, keep them flat by storing them in the cardboard envelope in which they were shipped. The Divine celebrates your creativity. Have fun. This talisman set has sold. 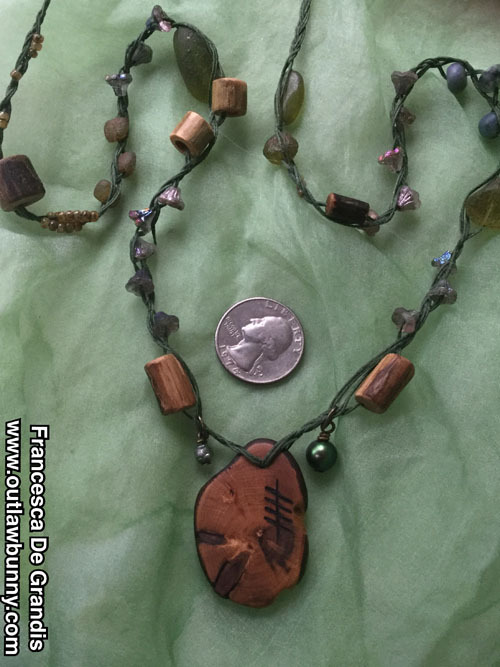 1) It discusses a vision that inspired a series of shamanic necklaces. I’d love to share that vision with you. 2) Most of my sets are shown through private viewings, e.g, my newsletter. I list a few sets here to introduce my sets to site visitors. This one-of-a-kind set is available exclusively to one of my newsletter subscribers. Crafting amulets only for folks traveling alongside me feels true to who I am. If you don’t subscribe yet, click here for a free subscription: https://www.outlawbunny.com/newsletter/. I ritually blessed both amulets in a major Faerie rite. 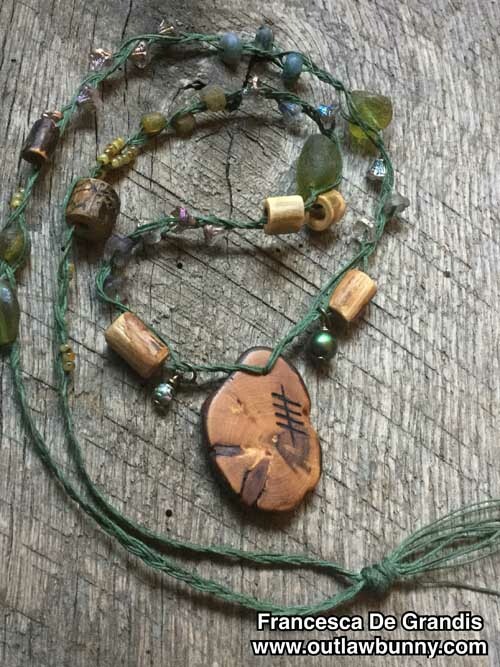 The set includes a one-of-a-kind Faerie Shaman necklace titled Fey Memories of Future Days. It is pictured above and in photos below. I had a vision in which a necklace appeared and told me what its magic would be. It said, “I am the spaces in between, the hidden places of power, safety, and beauty. Wear me to be in those places. “You can live in them throughout the day, live your mundane life in safety, beauty, and power, without it being obvious to those without the eyes to see, or those to whom your essence should not be revealed. “I’m not meant to adorn the loud flashy Pagan who has more volume in speech than actual power in deed. Instead, I am the amulet to foster the power, safety, and self-realization of the quieter practitioner—the Fey soul who strives to live magic. “I’m the dark rainy day that most people complain about, but in which you find ecstasy. I am the gray days of winter that most people dread, but in which you find peace. I am the magical circle between the worlds. I am the heart full of joy in solitude. “I am the road you wander, thinking yourself lost, until the way before you opens into the primordial forest, where Fey welcome you. I am all hidden places that are goodness. Adorn yourself with me to receive the blessings those places confer. “Know I am bestowed upon you by Goddesses often viewed as one-sided, as only fierce or frightening. You know that those who hold such limited views miss immense Divine blessings. “The Snow Goddess brings death in winter, but She also brings snow-dusted winds sparkling with enchantment that ignites hope and fortitude in even the weariest heart. She is also a springtime Goddess, bringing pale budding greenery and sweet blossoms of new beginnings. She is only one example of Goddesses viewed in too limited a manner. Here’s another: many a dark Goddess, lauded for dangerousness or ferocity in battle, is known by too few as a gentle, kind healer and peaceful companion, loving us in the dark maternal safety of Her starlit womb. I ritually imbued this set’s one-of-a-kind necklace with the powers described in the vision. I was delighted to receive additional visions of a few more Hidden Power Places necklaces. Each has an entirely different-looking design, yet all have the same magic shown in the first vision. Each distinct design represents a different doorway into the powers described in the first vision. Faerie Shaman, your DNA holds memories that promise your day can be beauty. These memories are a door to hidden places of power. As are your whimsy, lightheartedness, down-to-earth attitude, and love of Nature. 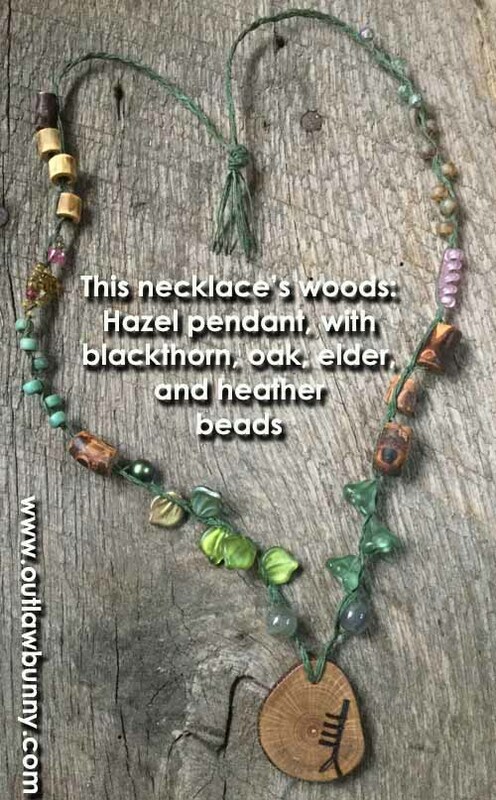 This necklace is a blend of new and old beads, which I wove together, while also weaving magical power into the necklace. Almost all the beads are designer beads. It takes time to find the right looking beads, let alone with large enough holes for what I do. Even tiny designer seed beads might be costly. Time and money spent are worth it because I try to create dreams with jewelry. I don’t want the wrong beads to pull someone out of the dream. 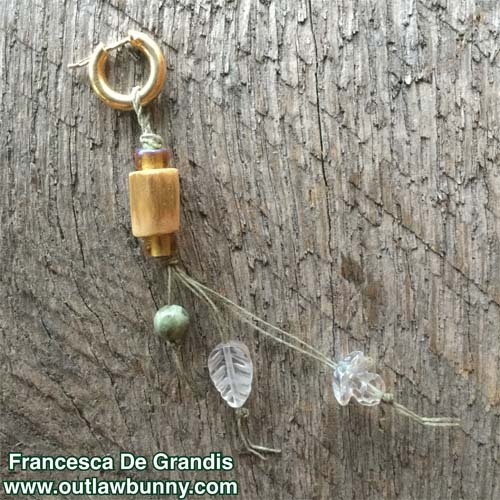 Modern bead makers have amazing techniques. 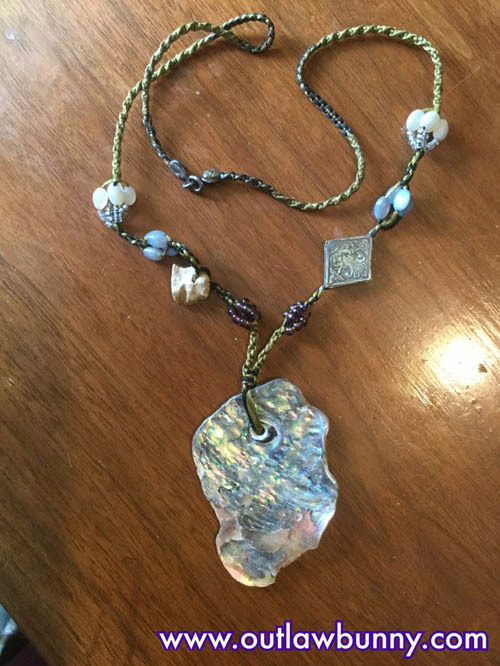 For example, beads can be etched or subtly multicolored, as if time had weathered them, creating an aged look that can be perfect for my designs. Or a luscious patina can add an otherworldly feel. The pendant is moss agate. 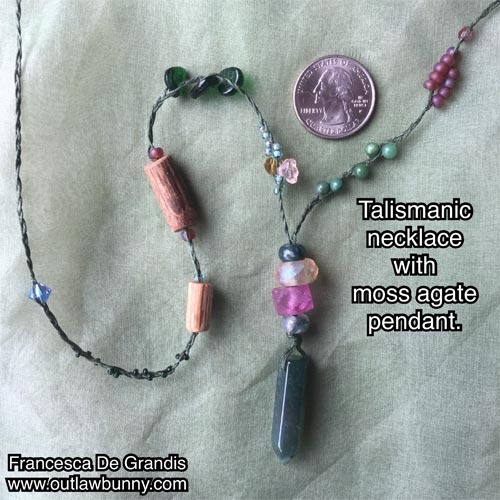 Above it is a moss agate bead, then a rosey-pink Bali recycled glass bead, then a luminescent-honey, faceted bead with a pink blush at the top rim when the light hits just so, and then another moss agate. Here is information about some of the other beads. Past the pendant and aforementioned beads, one side of the necklace starts with wee, round, green stones that I was told might be aventurine. They also look like they might be quality jade. I’ve no expertise in gemstones identification, so my guess holds no weight. But they really look that way to me, and were part of a destash that had some fine pieces. In any case, these sweet green beads have an ancient, lovely, calming yet vivacious energy that runs smooth as a quiet pond’s surface. 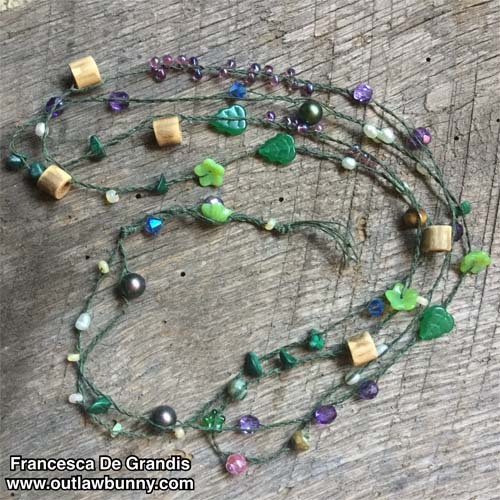 If memory serves, I acquired that destash about 12 years ago, so who knows how old these green beads are. If they are really old, it’s more likely they’re fine jade. 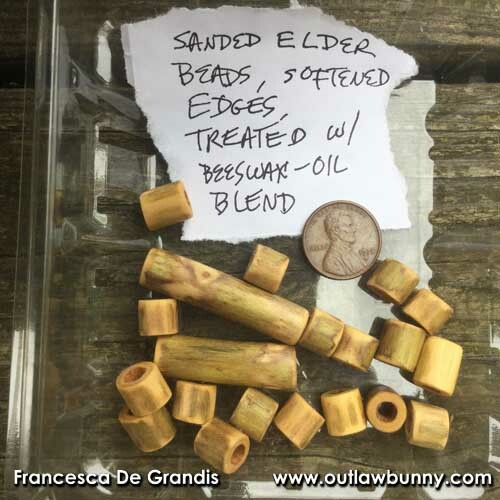 I often save beads until I find just the right use for them—even if that means them sitting in my stash for decades—so it’s lovely to tell you about old beads so you know how special these talismans are to me. I’ve possibly had some of the other beads 10 or 15 years, but I’m not sure. There are also two oak wood beads I made. 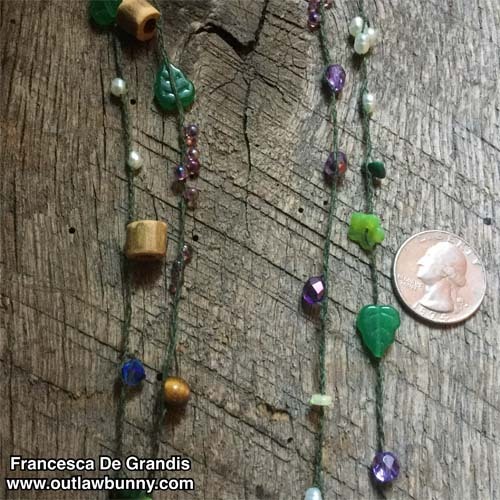 The last bead on the side of the necklace with those two oak pieces is a Swarovski crystal. I associate oak with the Green God, often known as Herne, and with the green Goddess, often known as Elen of the Ways. If you enjoy using a wand, the pendant is a fine keppen. (A tiny wand is called a keppen). It is a general purpose wand, but you could also gently tap yourself with it, to be enfolded by the power this talismanic necklace bestows. Simply wearing the necklace will do the same thing, but it’s a nice and different experience to do it with the wand. I left the top part of the necklace simply braided and bead-less because that looks nice, is more comfortable, and makes the necklace hang nicely. 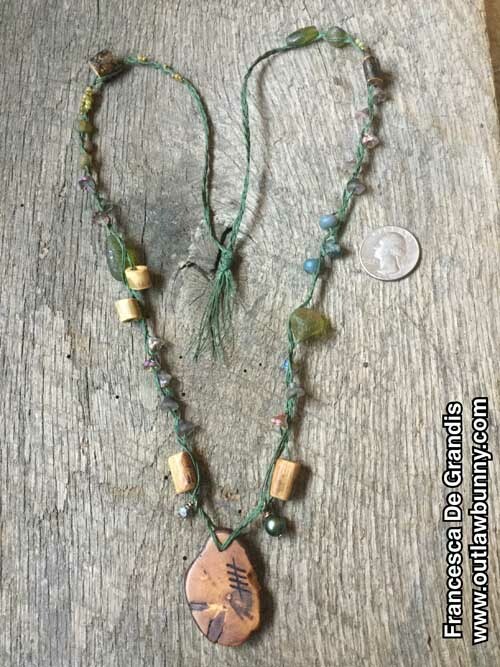 The necklace is woven with waxed linen cord. To benefit from the power of the necklace, when you don’t want to wear it, put it on your altar. 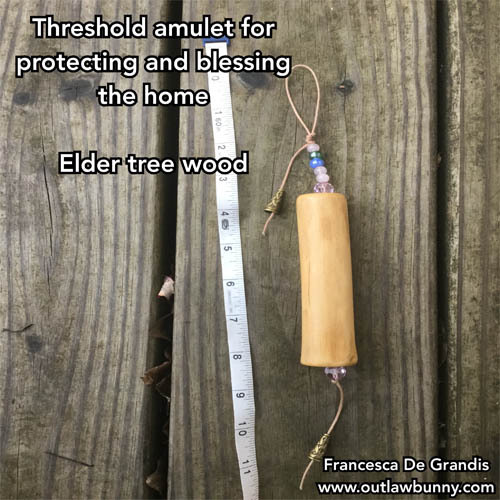 This set also includes an elder wood threshold talisman to protect and bless the home. This lintel amulet will do its magic when hung by or above the door, another opening to the outdoors, or elsewhere in your dwelling. 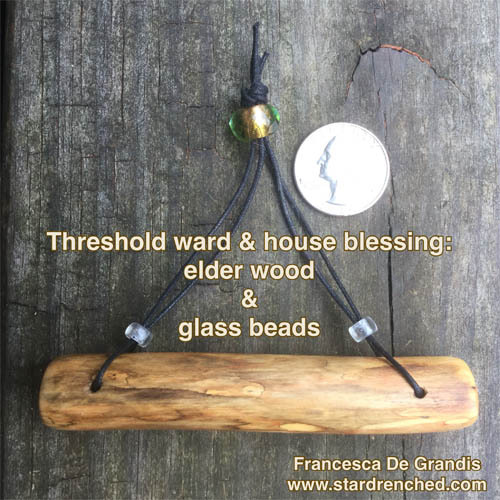 You could instead use this threshold charm as a protection and blessing for a space other than a home. Elder wood can add power to your magic, facilitate change, protect from evil spirits, and be used in exorcisms. Elder is sacred to Goddesses Freya and Holda, as well as to the Crone Goddess. I myself experience elder as invoking the Great Goddess, Creator of All Things. Some folks, myself included, meet a Goddess called “the Elder Mother” living in the tree. One reason I started woodworking was to discover mystical powers a specific type of wood might have that go unmentioned in any books, blogs, etc. When woodworking, I experience a wood firsthand and at length; this intimate, direct experience creates a chance for the wood to speak to me, sing to me of its powers, and bless me with them. When sanding elder, it appears primordial to me—the original archetype of a tree mystically. * and devotes substantial time to serving humans (as opposed to serving non-corporeal beings. My emphasis on humans doesn’t diminish the importance of serving spirits. I’m simply stating what’s needed to work with elder wood). If the above requirements are met, elder wood can safely provide all the marvelous magic described in the three paragraphs that kick off with “Elder wood can add power.” For anyone other than the type of person I described, elder wood energy might automatically backfire harmfully on them. So I dare not sell an elder wood talisman without cautionary statements. To readers who lack confidence: if you underestimate your devotion to the Goddess, the importance of the service you provide your community and/or family, your surrender to Her, and its humility, then your under-estimation might not let you realize that you can use elder wood when many others cannot. Magic is everyone’s birthright, but not every magic is right for everyone. I’m comfortable with elder, adore it, but I couldn’t work with a garnet stone if my life depended on it. If you think elder is safe for you though you don’t fulfill the requirements listed, trust yourself. My belief in elder’s restrictions is purely my own. I’ve never seen it in lore. It is something the Old Gods of the Druids told me directly. Even if it appeared in traditional material, lore is not law. You are the ultimate authority on you. 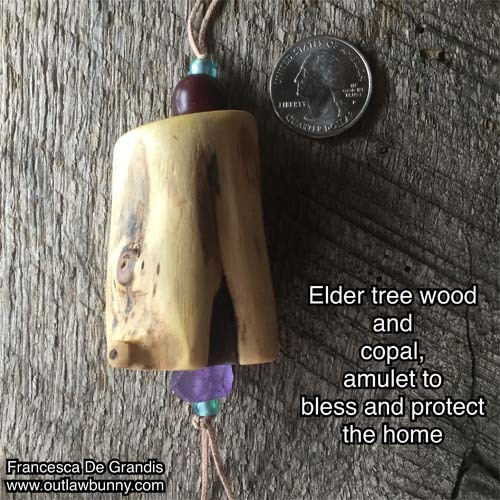 You might consider spitting on the ground outdoors, as a one-time offering to the Elder Goddess and the Great Mother, before you first hang this elder wood amulet in your space. Lore tells us to never burn elder. 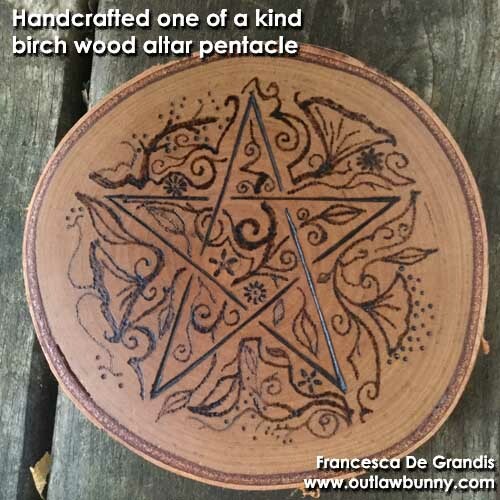 Many folks, myself among them, believe that includes pyrography. I want to add that the serious, hard-working Elder Mother is also lighthearted, gentle, and merry, if you get to know Her. A far cry from the dour depictions often given of Her, She enjoys my joy and whimsy. Above the elder lintel charm is a large piece of copal, and below is lavender-colored Bali recycled glass. 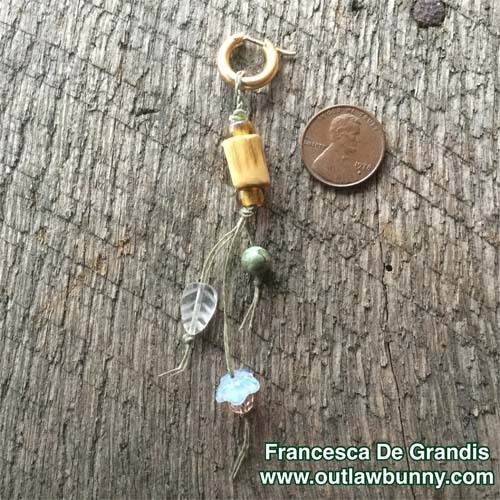 The two wee blue pony beads were in my stash ballpark 15 years, waiting for the right use. Elder has a soft pithy core. I hollowed it out, to put a string through it so you could hang this talisman on your wall. The core was off center, so the elder hangs at an angle. That natural hollow is a channel through which magic can travel to this realm. Your set will arrive with simple care instructions for your amulets. I’ll also enclose a print up of this PDF. All wood was ethically harvested and finished with a natural beeswax and oil treatment. 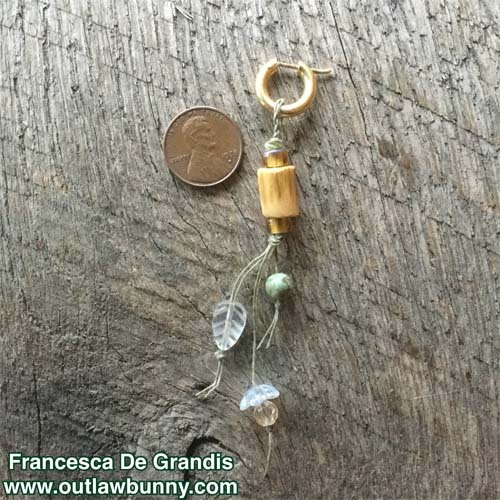 The lintel charm is strung on waxed cotton cord. 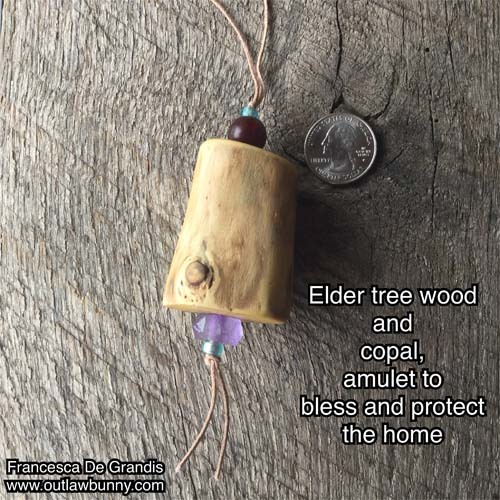 Before I talk further about the magical properties of elder wood, I want to explain that I do woodworking as a shamanic rite, making amulets for myself and others from various woods, including elder. 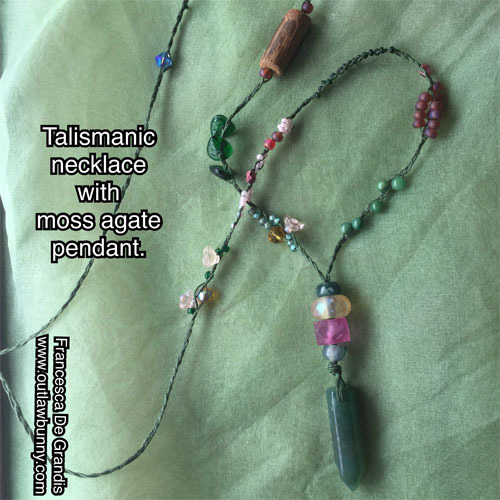 All photos of elder show one-of-a-kind talismans I’ve designed and made. One reason I started woodworking was to discover mystical powers a specific type of wood might have that go unmentioned in any books, blogs, etc. When woodworking, I experience a wood type firsthand and at length; this intimate, direct experience creates a chance for the wood to speak to me, sing to me of its powers, and bless me with them. When sanding elder, it appears primordial to me—the original archetype of a tree mystically. If the above requirements are met, elder wood can safely provide all the marvelous magic described in the three paragraphs that kick off this post. For anyone other than the type of person I described, elder wood energy might automatically backfire harmfully on them. So I dare not sell an elder wood talisman without cautionary statements. Lore forbids cutting from the elder tree without its permission. There is also a tradition of saying, before cutting into an elder tree, “Lady Ellhorn, give me some of your wood, and I will give you some of mine when I grow into a tree.” There’s also a tradition of spitting on the ground by the elder tree, to protect oneself from the tree. However, I myself, when harvesting from a plant, might spit by the plant to give it some of myself in exchange for its giving some of itself to me. This practice is something I came up with myself, but I intuit—and it just makes logical sense—that spitting by the elder tree gives some of one’s own “wood” to the tree. In other words, spitting gives part of yourself as an offering to the tree, just as I do when I spit by a plant. To help alienate people from the Old Religion, the Christian church created new lore supporting the falsehood that elder trees are evil. Spitting to protect oneself from the tree could easily have been part of this alienating lore and a bastardization of spitting as an offering to the tree. Not that I know of any lore saying that you spit by a tree as an offering to it, but I think there’s a good chance that idea could be found in lore. After all, if I came up with the idea of spitting by a tree as an offering, other people must have had the same idea ever since the first trees existed, in which case my/their idea could have entered lore. You might consider spitting on the ground outdoors, as a one-time offering to the Elder Goddess and the Great Mother, before you first work with elder wood magically. I wood burn designs on many of the talismans I make but, luckily, elder wood is lovely as is. Even if a piece of it has no pattern, its color is usually scrumptious enough to make it fabulous looking. Not that a piece of elder has to be pretty in order to be a good talisman. But, for me, beauty has its own magic. Besides, in some ways, I find every last piece of wood in existence gorgeous. 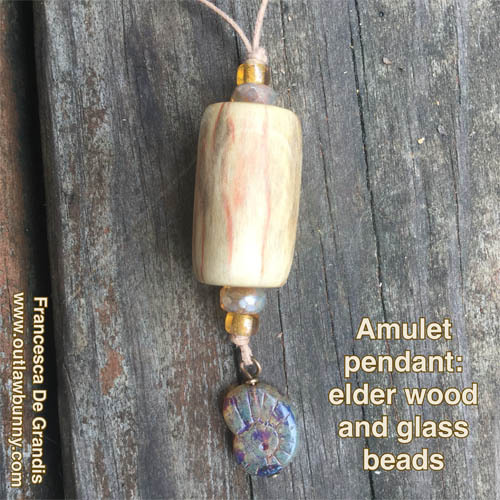 Making amulets is a joy for me. 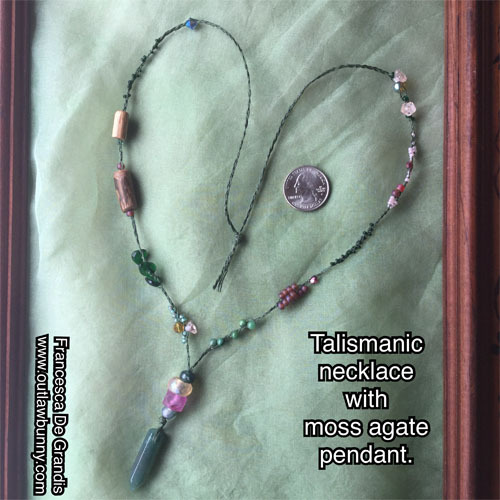 My talismans are available exclusively to my newsletter subscribers. Crafting amulets solely for folks traveling alongside me feels true to who I am. 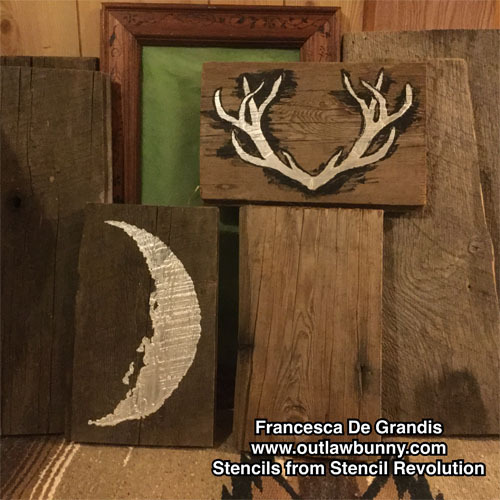 If you don’t subscribe yet, click here for a free subscription: https://www.outlawbunny.com/newsletter/. This talisman set has sold. Read this post anyway to learn about one-of-a-kind sets. Most sets are shown through private viewings, e.g, my free newsletter. I list a few sets here to introduce them to site visitors. I ritually blessed all the amulets in a major Faerie rite. 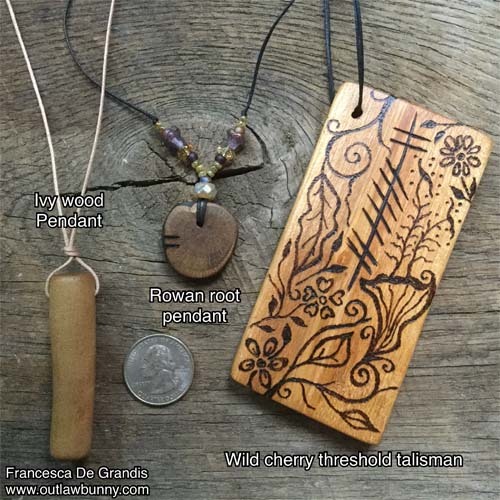 This set includes a threshold talisman to protect and bless the home: pyrography on wild cherry wood. “I bring you strength and comfort. I bring richness to your days—richness of wealth, of fulfilling activities, of lush surroundings. “Not all extravagance is purchased. Enjoy the extravagance found in the dark depths of the forest. Plunge into winter’s icy ocean water, so its chilled currents can thrill your skin. Hike into the mountains and keep going higher, until there is no one but goats and sheep and Fey Folk and you. “Sing an extravagant song of praise for the hustle and bustle of an urban street. “Enjoy an extravaganza: study everyone who passes you on a city street and realize each of them is a cosmos unto themselves. “Be adventurous. The strength to do so is within you. From the middle of the cherry to its top, Ogham letters spell out the Gaelic word for love. That seemed a perfect word for an amulet to safeguard and bless because the Old Gods take good care of us in Their love for us, and because love in a home is among the greatest blessings. 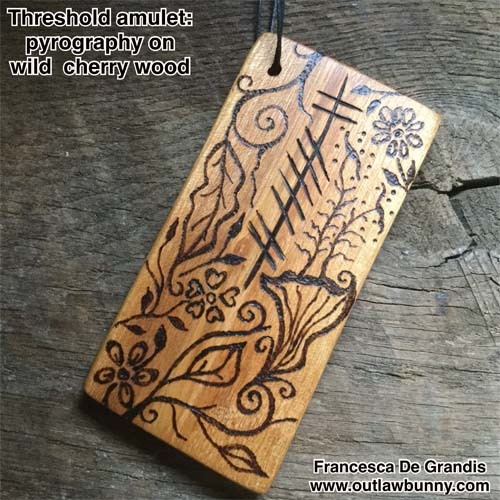 The pyrography is my original one-of-a-kind shamanic design that adds to the cherry’s powers. Home decor with mojo. My pyrography is done ritually to add yet more power. 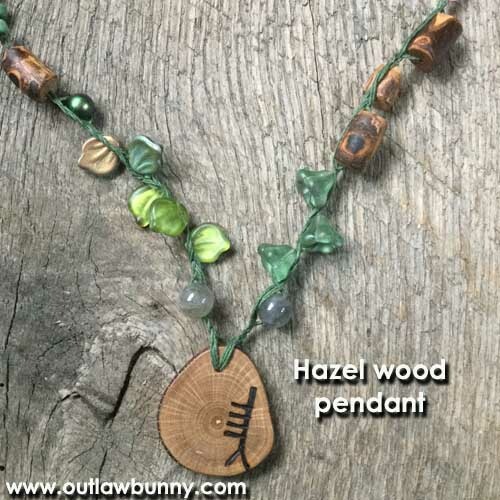 This set also includes an amulet pendant crafted from ivy wood. Ivy is commonly known as sacred to the Green God. This ivy wood could give you vitality and free your energy, so your confidence, determination, and overall power come forth more fully. Ivy also revs up your sexuality. Since ivy “belongs” to the Green Man, I think it should also belong to the Green Woman: Elen of the Ways. For me, She has all the powers of the Green God. My sense of Her also is that, for those who want nature’s power but need it channeled to them gently, She can do that for them. He can too, but sometimes a person finds it easier to accept that gentleness and sensitivity from Her. Since the Green God and Green Goddess both embody living fully, I feel this ivy amulet would help you be in the moment. This is good jewelry to wear in honor of the wild Green God and Goddess. Toward the bottom, I pyrographed the Ogham letter that corresponds with ivy. Again: the pyrography is executed ritually. 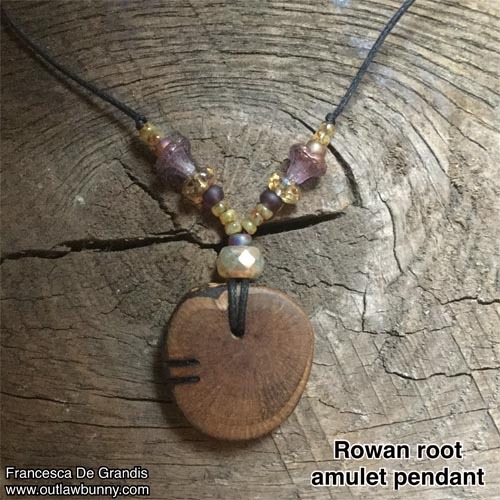 The set also includes an amulet pendant crafted from Rowan root. Obstacles to the fulfillment of my wishes become a non-issue. I reach goals regardless of obstacles, and without acknowledging them or otherwise dealing with them. I’m not suggesting tree root magic, in ignoring an obstacle, blasts through it without even noticing. I’m saying I needn’t concern myself magically with an obstacle to my desired goal—needn’t remove barriers, circumvent barriers, or deal with them any other way. I needn’t limit myself by fixating on the route to my goals (in the sense of believing I must remove blocks in order for the route they are blocking to open for me); magic will get me there along the route that magic chooses. Roadblocks are a non-issue because, even if all impediments remain in place, my wish is fulfilled because tree roots are truly magic, the essential archetype of it, fulfilling my wishes against all reason, helping me live in a world where I’m not hemmed by in living in the logical world—and the road blocks it insists will hinder me—but can instead trust in an enchanted world. My experience that tree root magic can bypass obstacles without necessarily even removing them affirms my belief about life overall: I find it vital, when at all possible, to leave the parts of life that aren’t “mine” as is; that includes neither removing blocks or otherwise dealing with them, but just going my merry way; a focus on removing blocks or otherwise dealing with them distracts me from living my life and working toward my goals. Of course, there are times we have to remove blocks, but I’m not addressing those times here. I once felt rowan wood’s dominance as the witches’ wood undeserved, and its power greatly overrated. And … well, I felt modern use of rowan was simply trendy. Oops! Eventually, I understood rowan’s many benefits and why it deserves its prestige. I’ll address two of its traits here. About the beads: I love them. I’ve been hunting down designer beads that I can use in talismans to create the looks I envision. 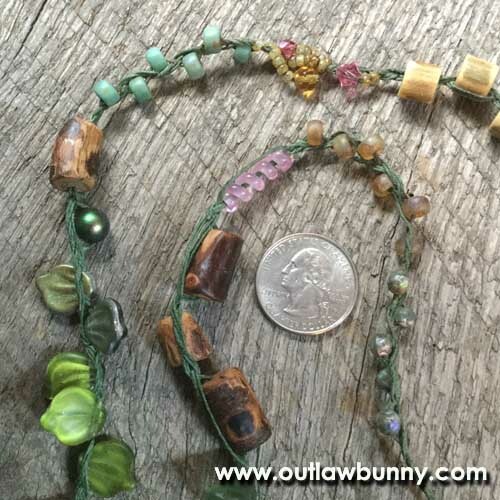 I do mean hunt because it takes time to find the right beads, let alone with large enough holes for what I construct. Even the smallest of these beads are designer. That costs me more but I want to create dreams with jewelry, and the wrong beads might pull someone out of their dream. Most of these beads were artfully crafted to have an aged look. 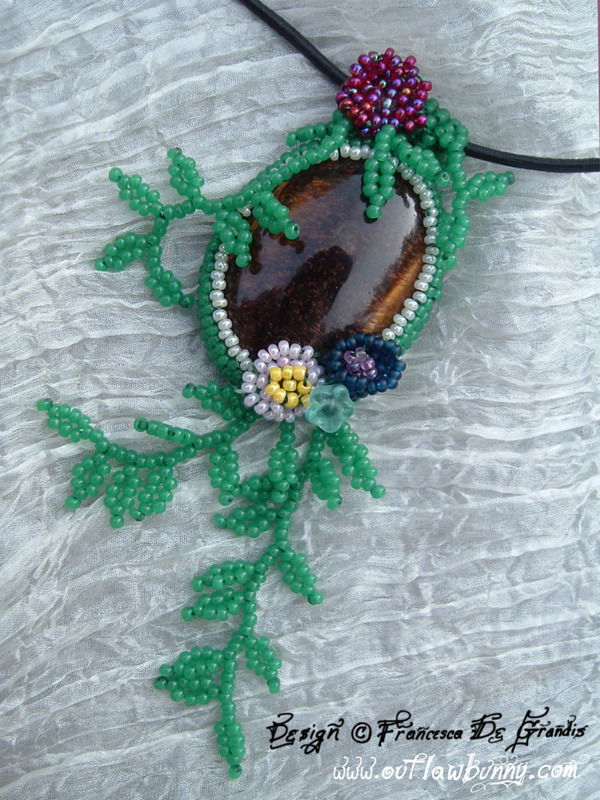 E.g., the larger bead reminds me of old glass that acquired a shimmering patina by being buried in the earth for years. 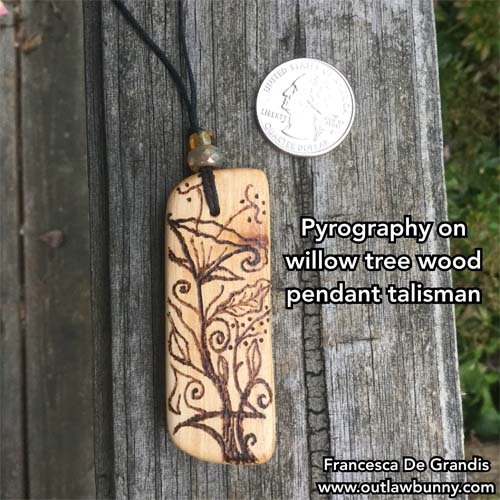 I pyrographed the rowan Ogham on one side. Both sides are lovely wood so either can be worn facing front. To benefit from the power of either pendant, when you don’t want to wear it or otherwise carry it on you, put it on your altar. Your set will arrive with simple care instructions to keep your talismans beautiful. I’ll also enclose a print up of this PDF. All wood was ethically harvested, finished with a natural beeswax and oil treatment, then strung on waxed cotton cord. You don’t have to attend an event or do any work. Just enroll, and I do the work for you. It is easy to receive this blessing. The energy of the ceremony shapes itself to your specific needs. I do a spell to help your life and your enjoyment of it advance … to the max. Whether you celebrate any type of holidays this season or not, whether you’re with loved ones on the holidays or not, I want to help you enjoy yourself now and long after. Benefits last long after the Solstice—for months, if not years—helping your New Year be one in which you find joy and the means to make the life you want to live. The ceremony starts December 17. The five days during which I do the rite will be spread out over the week Yule occurs. Yule, which is a major Pagan holiday, is a powerful shamanic time. Total Cost: $100. Scroll down to enroll: enter your phone number and pay securely with PayPal. Pls provide yr phone number. Upon receipt of payment, I email you confirmation of registration. If you need more info or want to discuss scholarship, partial scholarship, payment plan, or trade, do phone me at 814.337.2490. Magic is not a substitute for medical care by a physician, psychiatric counseling, or other therapeutic treatments. Participants are personally responsible for the consequences of their voluntary participation. This ceremony is extraordinarily effective but may not work for all individuals. No refunds. Benefit from magic spun for five days for you.